The collection of bridges in a local area network (LAN) can be depicted as a graph whose nodes are bridges and LAN segments (or cables), and whose edges are the interfaces connecting the bridges to the segments. To break loops in the LAN while maintaining access to all LAN segments, the bridges collectively compute a spanning tree. The spanning tree is not necessarily a minimum cost spanning tree. A network administrator can reduce the cost of a spanning tree, if necessary, by altering some of the configuration parameters in such a way as to affect the choice of the root of the spanning tree. The spanning tree that the bridges compute using the Spanning Tree Protocol can be determined using the following rules. The example network at the right, below, will be used to illustrate the rules. 4. 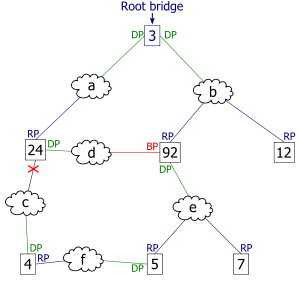 The least cost path to the root from network segment e goes through bridge 92. Therefore the designated port for network segment e is the port that connects bridge 92 to network segment e.
Select a root bridge. The root bridge of the spanning tree is the bridge with the smallest (lowest) bridge ID. Each bridge has a configurable priority number and a MAC Address; the bridge ID contains both numbers combined together - Bridge priority + MAC (32768.0200.0000.1111). The Bridge priority default is 32768 and can only be configured in multiples of 4096. To compare two bridge IDs, the priority is compared first, as if looking at a real number anything less than 32768...will become the target of being the root. If two bridges have equal priority then the MAC addresses are compared; for example, if switches A (MAC=0200.0000.1111) and B (MAC=0200.0000.2222) both have a priority of 32768 then switch A will be selected as the root bridge. If the network administrators would like switch B to become the root bridge, they must set its priority to be less than 32768 or configure the spanning tree a root primary/secondary. When configuring the root primary and root secondary the switch will automatically change the priority accordingly, 24577 and 28673 respectively with the default configuration. Determine the least cost paths to the root bridge. The computed spanning tree has the property that messages from any connected device to the root bridge traverse a least cost path, i.e., a path from the device to the root that has minimum cost among all paths from the device to the root. The cost of traversing a path is the sum of the costs of the segments on the path. Different technologies have different default costs for network segments. An administrator can configure the cost of traversing a particular network segment. The property that messages always traverse least-cost paths to the root is guaranteed by the following two rules. Least cost path from each bridge. After the root bridge has been chosen, each bridge determines the cost of each possible path from itself to the root. From these, it picks one with the smallest cost (a least-cost path). The port connecting to that path becomes the root port (RP) of the bridge. Breaking ties for root ports. When multiple paths from a bridge are least-cost paths, the chosen path uses the neighbor bridge with the lower bridge ID. The root port is thus the one connecting to the bridge with the lowest bridge ID. For example, in figure 3, if switch 4 was connected to network segment d instead of segment c, there would be two paths of length 2 to the root, one path going through bridge 24 and the other through bridge 92. Because there are two least cost paths, the lower bridge ID (24) would be used as the tie-breaker in choosing which path to use. Breaking ties for designated ports. When more than one bridge on a segment leads to a least-cost path to the root, the bridge with the lower bridge ID is used to forward messages to the root. The port attaching that bridge to the network segment is the designated port for the segment. In figure 4, there are two least cost paths from network segment d to the root, one going through bridge 24 and the other through bridge 92. The lower bridge ID is 24, so the tie breaker dictates that the designated port is the port through which network segment d is connected to bridge 24. If bridge IDs were equal, then the bridge with the lowest MAC address would have the designated port. In either case, the loser sets the port as being blocked. The final tie-breaker. In some cases, there may still be a tie, as when two bridges are connected by multiple cables. In this case, multiple ports on a single bridge are candidates for root port. In this case, the path which passes through the port on the neighbor bridge that has the lowest port identifier [Port priority(default=128) + Port number] is used.